Some of the best coverage from the set comes from SlashFilm. During one conversation with Zack Snyder, he revealed that he was taken aback by the reactions to Batman v Superman. That negativity pushed him to try something different with Justice League: "I think the nice thing about working on Justice League is that it is an opportunity to really blow the doors off of the scale and the bad guys and team-building and all the stuff that I think I could justify as a big, modern comic book movie, if that makes any sense." 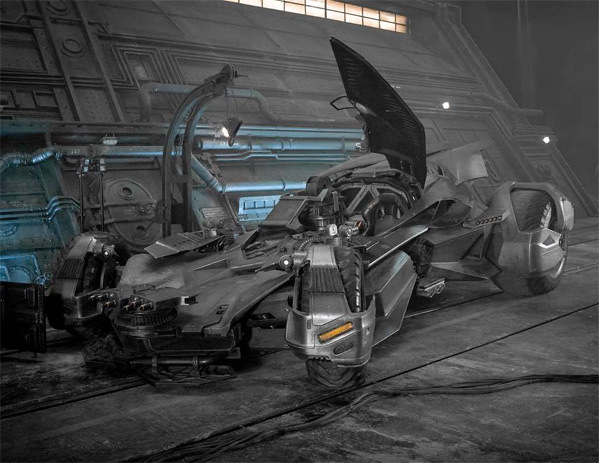 Here's a new look at the Batmobile, which looks a bit more sleek than seen before, but similar to Batman v Superman. An exact plot is still unknown, however IMDb provides this basic synopsis: Earth's greatest heroes are assembled to form the Justice League, to combat a threat beyond each member's capabilities. Zack Snyder is directing Justice League, from a screenplay written by Chris Terrio (Argo, Dawn of Justice). It will feature the DC characters: Batman (Ben Affleck) and Superman (Henry Cavill) as well as Aquaman (Jason Momoa), Wonder Woman (Gal Gadot), The Flash (Ezra Miller), Cyborg (Ray Fisher), Mera (Amber Heard), with Lois Lane (Amy Adams), Alfred (Jeremy Irons) returning, and Willem Dafoe in an unspecific role, plus J.K. Simmons as Commissioner Gordon. Word is that the villain will indeed be Steppenwolf. And Junkie XL is scoring (instead of Hans Zimmer). Those are the biggest confirmations. In addition to the set visit coverage on SlashFilm, they also learned that for now they're only making one Justice League movie - instead of Part 1 and Part 2. However, they couldn't get an official confirmation and it seemed more like they were unsure what would happen. Producer Deborah Snyder told them, "we're only ever planning and we are only doing Justice League." Zack added, "it is a complete movie", but countered by saying "hopefully there's some reason to go [on] — the movie doesn't end and you go, 'Okay, well that’s the DC Universe!'" There's also very interesting quotes in their Ben Affleck interview. "This is a step in evolution in that to bring together all of these characters who have had their origins. It’s about multilateralism…"
Warner Bros currently has Zack Snyder's Justice League scheduled for release on November 11th, 2017. I really don't know what I am looking at...a Batmobile "in progress"? We will have to wait and see it in action, but this looks horrible. I mean, of all things the Batmobile has to look cool, and they always have (except in Batman and Robin, of course). Does Zack Snyder have to mess up everything? He didn't mess up Watchmen, or man of steel, or dawn of the dead. Sorry I don't mean to get into a war of opinions but one of things that didn't disappoint about BvS was Batman and the bat mobile. I concur. Watchmen will always stand the test of time. I think Watchmen is in fact the absolute best comic book movie depiction ever made so far. Zack hit 95% of the story and tone. ANNNND he decided to go balls out and make it Rated R, making it very clear to everyone that money is not the issue here, its to pay homage and justice to the comic that Alan Moore brilliantly wrote. He did it for the fans, and no one else has the balls to do that. They care too much of what Hollywood thinks, they make everything 5 year old friendly, and most of all, they care about selling out and making huge paychecks at the end of it. OR..... they in fact never cared about the comic and just make the movie cause that's what's selling right now. Say what you will about Zack, but hes a diehard comic fan, and at the end of the day, that's the type of person i want bringing my favorite comic books to life! My initial comment was over the top..I liked MOS, but everything else has been a muddled ...muddle. I mean, I love over- saturated movies like Sin City and early Tarsem Singh, who used natural locations. I just think Snyder over does. Watchman might have been true, but no fun. I'd say 3 things - the 2 you mentioned and throw in a badass wonderwoman in the final battle - great stuff. "Jacked JK" is the main reason to see this movie. Seriously... He's going to be badass. is it behind the pile of industrial waste?